If you are looking for a fun toy to keep the kids busy (young girls especially, ages 5 and up), take a look at the Lil Lockitz Best Friend Party Pack from Amazon.com. This is a fun craft to keep kids occupied during a party, sleepover or if you need to keep them busy. They love making and personalizing their own jewelry. These are like a floating collage with their favorite things, plus they can wear them later or give them as gifts. This Party Pack will make 18 reusable Lockitz. Kids can wear them as a necklace, bracelet or use the key chain clasps to make clip-ons. The backpack clip-ons seemed to be the most popular choice. 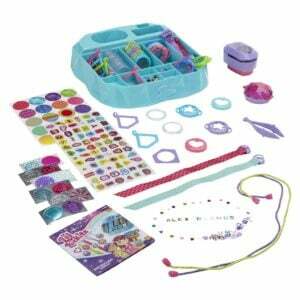 The kit includes Locket Tops with Backs, Necklaces, Bracelets, Key chain Clasps, Charms, Backgrounds, Letters, Tweezers, Photo Puncher, Crimper, Storage Container, and instructions. Due to the small parts, it is recommended for children 5 years of age and older. Pro-tip – put down a sheet before the kids start working so you can easily gather up all the supplies when they are finished. This is a sponsored post from ShopHer Media. All opinions are 100% mine.